Are you aware of Nifty stocks that are responsible to move the market? Well, Nifty constitutes 50 best stocks that shake Dalal Street. It is an index developed by NSE having top 50 stocks from diverse sectors. Nifty50 lets you know the overall market conditions. You can use Nifty50 as a benchmark as compared to your fund portfolio. 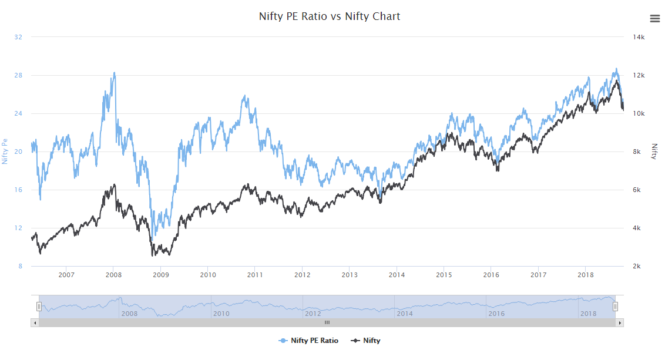 Presently, P/E ratio of Nifty50 is around 25 and it has yielded a dividend of 1.23. Sector-wise, Financial and Energy stocks have contributed around 34.65% and 15.87% respectively. The third highest contribution is done by IT and Consumable stocks. Other major constitutes of Nifty50 are Automobile, Metals, Construction, and Pharma. Moreover, Cement & Cement products and Telecom sectors also contributed above 1.5%. 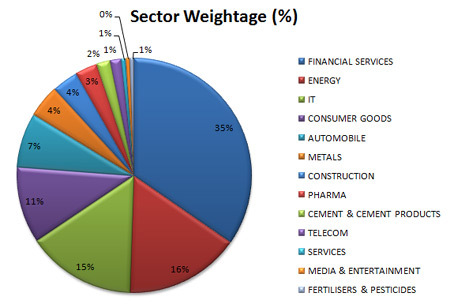 However, Services, Media & Entertainment, and Fertilizers sectors have the least contribution in Nifty50. Constituents of the Nifty index has top 50 stocks. However, I have listed 10 best stocks which are the major contributor in Nifty50. These stocks are giants and only a fraction of movement leads the markets to move up or down. You may find them in any fund portfolio. Moreover, from fund managers to FII’s, HNI investors to Big Bulls of stock market own them. Now, the question is why people own them as there are other thousands of stocks listed in stock markets. The reason is very simple and if you are a retail investor then you can hold them without any worries. You can hold them for long-term to get most out of it. You may be amazed by the facts that how much these stocks have returned over the years. So, if you get an opportunity, just brag them instantly. Always remember, that markets are always bullish in the long run. However, it may be bearish for short-term. So, focus on owning good and fundamentally strong stocks. Having said that, here is the 10 goldmine stocks of the Nifty50 index. If you haven’t owned them, then start accumulating on dips. Reliance Industries Limited is the king of Nifty50 and Sensex index. At the time of writing this post, it contributes 9.89% to Nifty. It belongs to Energy – Oil & Gas sector. HDFC Bank Limited is yet another giant that contributes 9.88% to Nifty50. It is a banking stock and eats maximum pie in the BankNifty index as well. Housing Development Finance Corporation or HDFC contributes 6.55%. It belongs to Financial Services like loans. Infosys is one of the top IT giants that contributes 6.37%. ITC is Consumer Goods stock that contributes 5.85% in the Nifty50 index. Tata Consultancy is another counter from Information Technology sector. It has 5.38% of contribution in the index. ICICI Bank constitutes 4.51% in the index and is one of the largest private sector banks. Larsen & Toubro or LT is a Construction and Engineering company that contributes 3.60% to Nifty50. Kotak Mahindra Bank is another growth-oriented private bank. It has 3.50% of share in Nifty index. You may find Hindustan Unilever or HLL products on your kitchen shelf. You may wonder that HLL is using maximum space in your kitchen as well. It has a 2.64% contribution in the Nifty index. You can also invest in other 40 stocks of Nifty50 instead of above 10 major Nifty contributors. NSE keep changes the list and update it time to time. So, you need to keep an eye on these changes and shuffle your portfolio accordingly. The stock market is dynamic in nature and so you must adopt any changes quickly. Here are the other constitutes of Nifty50 that you may consider to invest. Before you invest or trade in any of the stocks mentioned here, please re-check the data and information. I update the information frequently and when required. So, keep visiting or bookmark this post to get the updated info. Like this post, then kindly share it on your social networks.